(Nanowerk News) Smart and portable medical equipment is essential for fast and easy point-of-care and point-of-use diagnostics. Lab-on-a-chip applications in hand-held devices can help to save time for laboratory medical analysis in emergency scenarios. The combination of sub-micrometer-thick light emitting devices and photo-detectors with tunable spectral characteristics could play a key role in future sensing chips based on organic electronics. These applications realize the excitation and detection of fluorescence or phosphorescence in a marker. Even time-resolved measurements are possible. 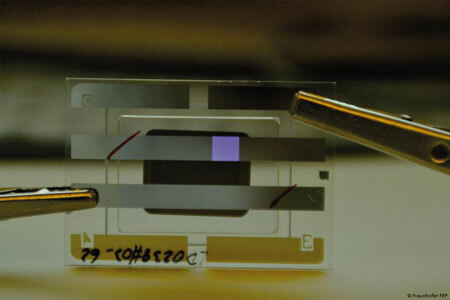 The integration of both, OLED together with organic photodiodes into one chip could be a way to achieve low-cost personal diagnostics outside the laboratory. At IDW 2014 Fraunhofer FEP presents two different OLED-device concepts: one emitting in the near UV and another one in the green spectral range which both could be integrated to sensor applications. These two exemplary OLED developments can be used for biomedical and biotechnical sensing in lab-on-chip applications. Near ultra-violet emission from an OLED is demonstrated for bottom- as well as from top-emitting device architectures. Furthermore, the scientists from Fraunhofer FEP combined a green top-emitting OLED with a thin-film optical filter and thin-film encapsulation so that a sample substance can be brought in proximity to the excitation source. Both developed devices are suitable for large area deposition and integration on silicon-backplanes like wafers as light source for optical excitation to detect fluorescence or phosphorescence signals. Later on, such device could be extended with microfluidics or external optics to fit a certain application. Next to the results for for OLED applications using UV-electroluminescence, Fraunhofer FEP will also present further demonstrators of our latest OLED microdisplays and flexible OLED on different substrates at our booth during the conference. Besides the exhibition Dr. Michael Thomschke will give a talk „OLED on Silicon for Sensor Applications“ about the latest approaches of OLED devices for lab-on-a-chip applications on Wednesday, December 3, 15:45 – 16:05 in Snow Hall B.